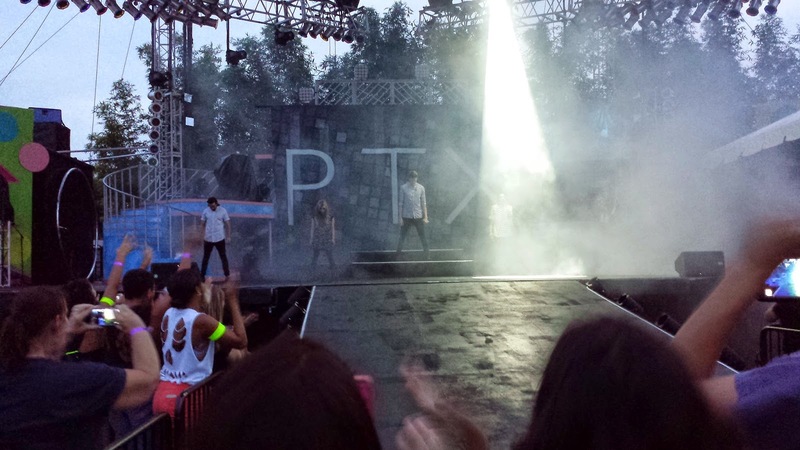 Last summer I had the pleasure of getting to see Pentatonix live on my birthday. If you haven't heard them, check them out on Youtube (Here is my favorite). For those who are unfamiliar with them, they're an awesome Acappella group. 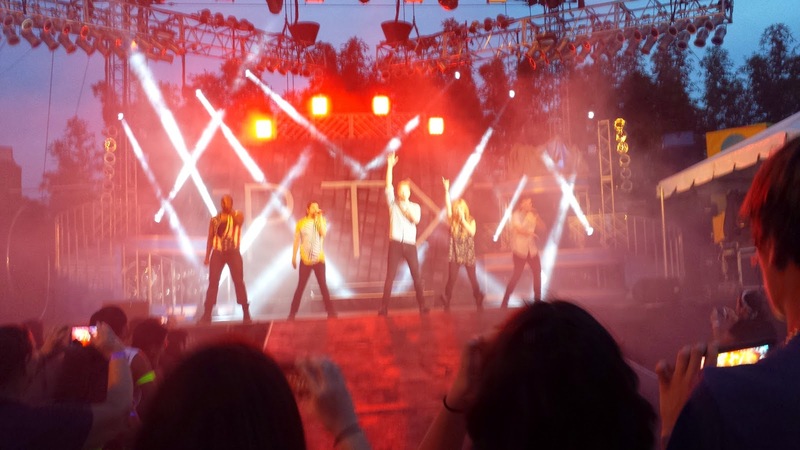 Anyway, they happened to be performing at Busch Gardens, which is one of my favorite theme parks and a place to which I already had an annual pass, on the day of my birthday itself. I felt like God himself had reached down and placed the concert in my lap as a gift for my special day. I had wonderful seats and the show was incredible. Probably the best one I ever went to if I'm being honest. Who knew a poppy and dance-happy Acapella group would actually sound better live than they do on the stereo? 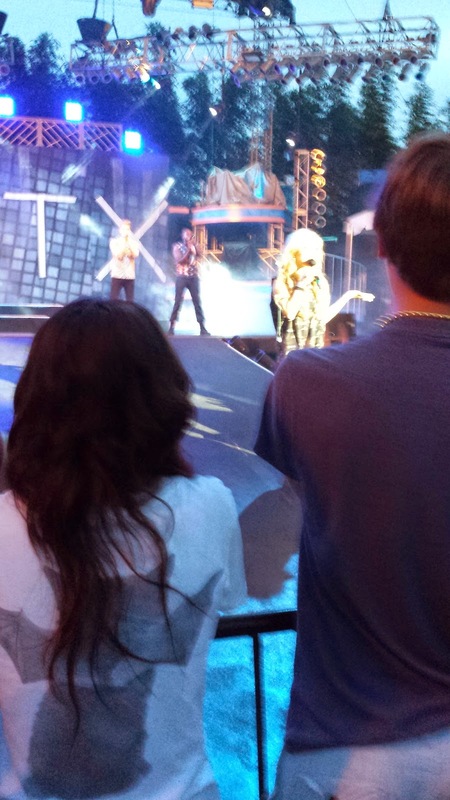 I was screaming and cheering along with all the other teenagers that I found myself in the midst of. I had my phone along for the concert and like most smartphones do these days, it has the capability to capture some amazing pictures. I snapped a couple shots, but didn't give it much time. I was too into the show. Afterward, when I looked back to see the photos I got during the concert I was presented with a collection of blurry and poorly framed shots. I've attached a few below for your amusement. I wasn't surprised, though. I hadn't put in the time to take a good picture, so I didn't expect one. So do I regret it? No, not even in the least bit. Every second that I spent taking a picture was a second that my focus was taken away from the performance. If I had given it some time I could have gotten some great shots of the show, but at what cost? Sure, in the scope of things a few minutes out of an hour long show is just a small percentage, but why should I sacrifice even a moment of time of something that I love? In life, there are lot of experiences that we have to endure that we don't really want to. That's why it's important to savor every little second of those moments that you love. In the movie, The Secret Life of Walter Mitty, Sean Penn's character is a famous and brilliant photographer. He has put a vast amount of effort in to find this rare wildcat in the Himalayan mountains. So after sitting there in the mountains waiting for a very long time, the cat finally emerges. He frames the shot to see the cat better, but never takes the picture. He just keeps stares in awe at the cat. The cat leaves and Ben Stiller's character asks why he didn't take the picture. Sean Penn answers. "Sometimes I don't. If I like a moment, for me, personally, I don't like to have the distraction of the camera. I just want to stay in it." It was a beautiful moment in the movie and it was one I completely understood (see the movie if you haven't, I promise you'll thank me). I didn't want the distraction of the camera when I was watching a concert from a band I loved. In the same way there are so many things in life that seem like they are enhancing our quality of life, but in reality they are just distracting us from enjoying it. Some people are so focused on looking for the things that will make their lives better: Climbing the corporate ladder, lusting after new cars, and fantasizing about every single luxury that they think they need. These are all just distractions. It's hard to enjoy the good in your life when you keep thinking about the 'better'. Have you ever seen someone who just got good news and instead of celebrating they start worrying about it right away? Doesn't it make you sad? Don't you want to grab them by the shoulders and shout 'be happy!' I know I do. When I was at the Pentatonix concert, while I was soaking up every moment of it, I saw those around me bumping others out of the way, trying to get the right angle, stressing about getting the best picture, and it made me sad. I wanted to shake them by the shoulders and shout 'Enjoy the concert. You won't get to when it's over!". Isn't that true about life, too? You don't get a second chance to enjoy those moments of happiness, so why waste time with distractions? Of course this is a small example to demonstrate a much larger thought. And I'm not trying to say that no one who has nice things is happy. I'm only throwing out a cautionary reminder to my friends because I care about the happiness of each and every one of you. Try not to get so distracted looking for the 'better' in life that you forget to enjoy the good. You might find there's a lot more of it in your life than you even realized. Okay so we left off last week with the revelation that Tae Woon was most likely the Dr. 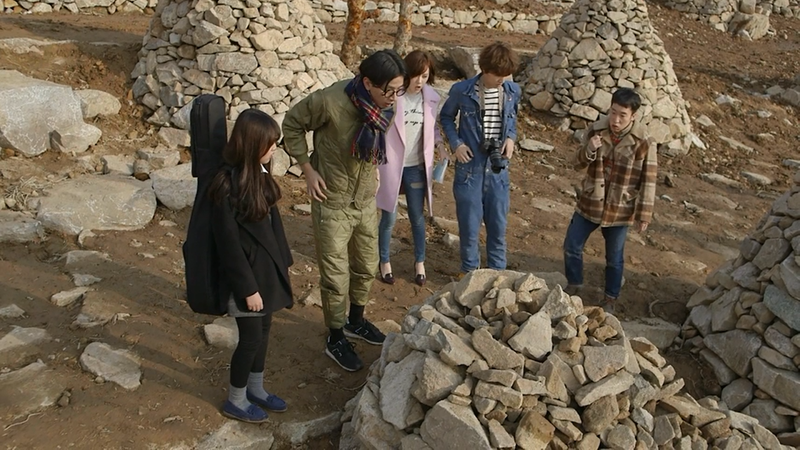 Seed that Ji Na was looking for. He was, of course, and he was totally super excited to see Ji Na. Ji Na understandably was not so excited. After all, she's trying to limit their encounters as much as possible, but he keeps showing up. Then it starts to rain and Ji Na is trying to take cover and run away, but has blisters from looking all over for Tae Woon and is wearing heels. He pulls out another one of those macho moves and covers her with her jacket and then lifts her onto his back to give her a piggyback out of the rain. She is uncharacteristically at a loss for words at his chivalry. I like their interactions during these moments. The tables turn and he takes charge and she just goes along with it. Ji Na goes to leave and Tae Woon offers her a ride. She can't really turn him down because she didn't drive there and they still have business to discuss. So they start heading back They briefly discuss work and don't get much accomplished. Then he asks her not to tell anyone he's Dr. Seed and she says she doesn't want anyone knowing they were together anyway. She sets her GPS for him and tells him to follow the directions exactly. Meanwhile at the office beautiful Hee Cheul is working late and guess who else? Oh, it's Hye Mi, big surprise. She asks him to take a coffee break and they go and chill out on the balcony. She asks him out for dinner and he only thinly veils that he is not at all interested, but she doesn't seem to get it. So back to Ji Na and Tae Woon. She's asleep by now and he's still driving. It's clear he thinks they're somewhere they shouldn't be, but remembers her instructions to follow the GPS no matter what so he keeps going. Some time later Ji Na awakes and it's morning and finds that they arrived at the ocean. She had selected the wrong city on the GPS and because Tae Woon did what she said without question he followed the directions there. Then it turns out the van's battery died while Tae Woon was waiting for Ji Na to wake up. It turns out they need a new battery and it'll take two hours. Ji Na starts to freak out and doesn't want to eat while they're waiting for the car's battery. 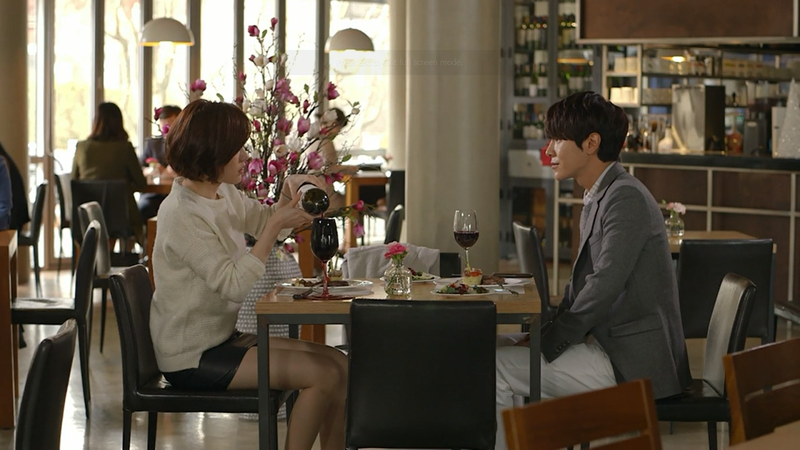 Tae Woon steps in and gets stern with her telling her that she has to eat because he doesn't want to see her hungry. She gets quiet again and follows him into town. To Ji Na's dismay the restaurants only serve spicy fish stew, which she says she hates more than anything else in the world. She ends up revealing that she has a vast knowledge of seafood giving a glimpse into her past, but she lies and said she has a lake house. When will the lies end, Ji Na?!? Anyway, Tae Woon's having a little difficulty with his food so she takes and cuts his fish for him in a genuinely kind moment and he has a flashback of his mother doing the same for him as a boy. He gives her the look that says he has never seen anyone more lovely in his life. They leave the restaurant and she's still limping because of her blisters and heels so Tae Woon buys her some ugly, but comfy shoes. Ji Na gets back to the office and overhears Hye Mi taking the (other) office ladies to lunch. 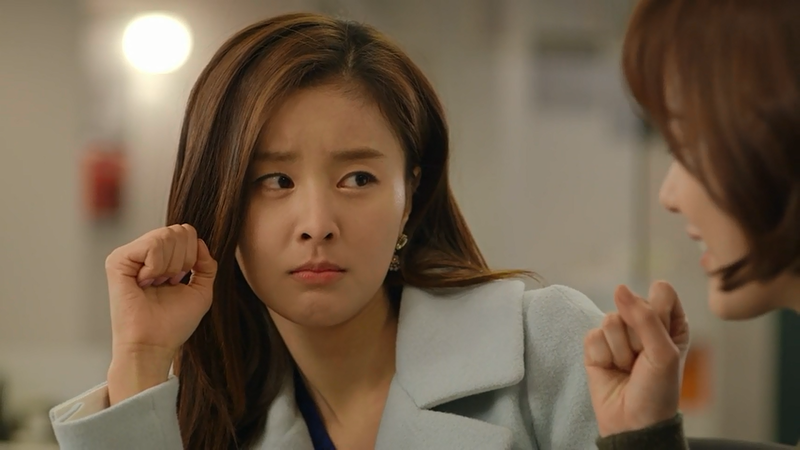 They insinuate that Hye Mi is kinder and more clever than Ji Na. Ji Na scowls- she knows where she stands now. At lunch the ladies are talking about how to win a man and Manager Oh explains that she got her very attractive husband by cooking 12 side dishes. Hye Mi's eyes sparkles. Hmm, wonder if she's going to try it. We get to catch up with the chairman who's off somewhere fishing. We find out that a "Senator Yoon" is trying to get enough shares to be the majority shareholder of the company and it turns out that he has a daughter that now works there who he's trying to get to marry Hee Cheul. Hello, Hye Mi! Also, that explains a lot. The chairman's assistant says that either way Hee Cheul will become the new chairman either as the chairman's son or the senator's son-in-law. 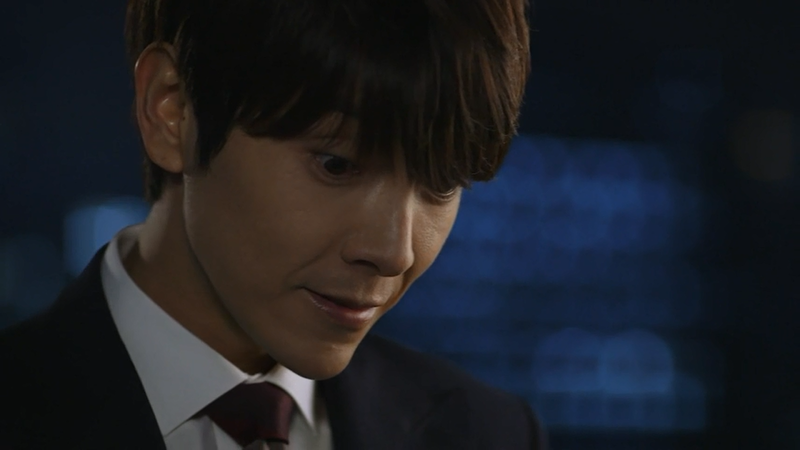 The chairman has an odd sort of look on his face, like he doesn't agree, or maybe he just feels guilty that Hee Cheul has to deal with that pressure. So now that we know that Hee Cheul's facing the pressure, he gets a call from the Senator. He lies to him and say he didn't know Hye Mi was working late the other day otherwise he would have eaten dinner together and says that going forward he'll make sure she eats her meals. This leads him to call Hye Mi and tell her that she can take him out for dinner that night. So guess what? She cooks for him. At least she tries. It turns out that she's horrible. 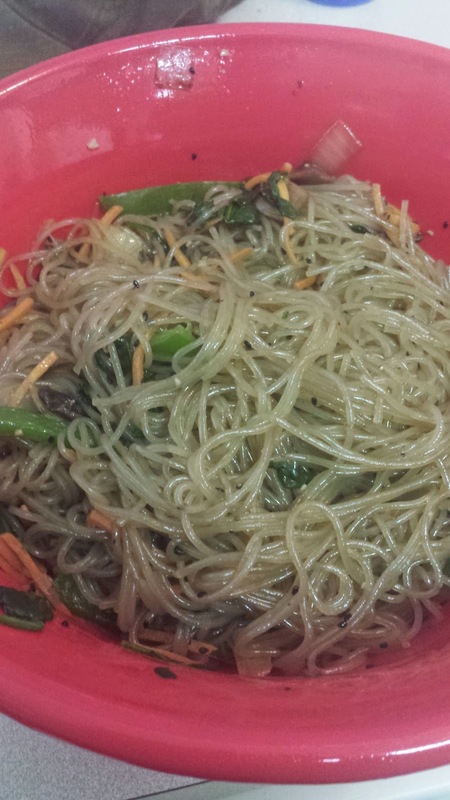 If I've learned anything from Korean dramas it's that about half of the Korean women can't cook, but all chaebols can. 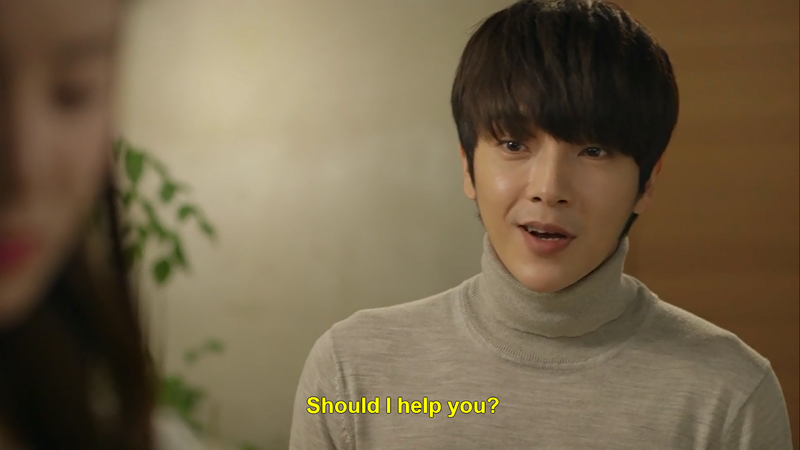 Hee Cheul offers to help. She turns him down and eventually they go out to eat instead. Hye Mi tells a little about her background and how she wants to accomplish things on her own without her dad doing it for her. She insinuates that this includes winning Hee Cheul over, which makes him feel a little guilty, because it seems he has no genuine interest in her apart from appeasing the Senator. Back at Ji Na's pad, her creepy friend has moved herself into Ji Na's house and while Ji Na tries to kick her out the girl threatens to call Ji Na's mom so she has no choice but to let creepo stay. Although I think it's good for Ji Na to have somewhere there to support her. She needs someone on her side like I've been saying, especially since the girls at work have clearly chosen Hye Mi's side (the wrong side). That was the recap and here are my thoughts. There are many this episode and they are quite opinionated. -Tae Woon is crazy stupid in love. He went from zero to sixty. Oh, his poor heart isn't going to be able to take it. The only way this is going to work is if Ji Na falls equally in love with him. I mean, I love Hee Cheul, but I wouldn't feel emotionally responsible if I didn't root for the Unfortunate couple to succeed. -I absolutely am in love with the character trait that Tae Woon displays where he can be all airy and fancy free, but when it comes to taking care of Ji Na he is very confident and assertive. This is such a unique K-drama character and while I didn't completely understand him in the beginning, he grows on me each episode. -I knew that GPS situation was not going to go well, but there are far worse destinations than the ocean. -The Chairman seems like he has a secret, more than one. Why do I feel like he's going to try to make Tae Woon CEO? I hope that's completely off-based because he would be a horrible CEO. -I used to feel sorry for you, Hye Mi, but now I just feel sorry for Hee Cheul. Take a hint, girl. He does not like you! He just feels obligated to spend time with you because your dad's got a lot of power. Just look at the faces he makes when he's talking to you. -I would never in a million years eat a food called "Busted Raven". Maybe because that's my sister's name, or maybe because it sounds hella nasty. -Am I the only one who doesn't think it's romantic when a girl reminds a guy of his mother? Guys who want to be mothered give me the creeps. -I love that Tae Woon feels bad that the shoes he got are ugly. -Apparently salad bars are a fancy place to eat in Korea. Lol. -"Flexitarian"? Really? These office ladies are really "trying to make fetch happen", aren't they? -Omo! When Ji Na tucked her friend in, that was adorable. Under the hardened facade she really is quite sweet. -I really hope Ji Na pulls off sprawling onto the floor like that. She's pretty good at that type of thing and now would be the perfect time to take advantage of that skill set. Today...is a rainy day. I don't just mean it's raining. It does that pretty much every day in Florida. I mean it's overcast, it's dim and everything has that grayish green color. Now, I'm not one of those people who loves rainy days, but I do find them fascinating. It's days like these that I feel like I'm living on a different planet or an alternate dimension. Imagine a world where there's only dim light and no sun. A world where the sky is a different color and it feels as if all happiness has been sucked from you like a dementor. Now imagine a rainy day. Aren't they one and the same? So to me a rainy day is chance to use my imagination and imagine what life in a universe without a sun would be like. It's kind of trippy and it distracts me from the fact that I'm drenched from the rain I've had to endure on the way from my car. But by the end of the day, I'm aching to see the sun again. I do not want to have to live in a world where there is no sun and that makes me oh so grateful to live on the planet and in the dimension that I am. So I'll take this rainy day that you're throwing at me today, nature, but I'll be glad to have my sun back tomorrow. And luckily I live in a land where a sunny day is just around the corner. Today I had planned to go to the beach with my sister. Well, she bailed on me last minute. She has a habit of doing this and I have a habit of trying to re-arrange my schedule to fit what she wants to do, but not today. Today I was sick of it. I'm an independent woman who doesn't need to rely on others to have a good time, so I decided to go to the beach by myself. As humans, we don't usually like to go places alone. Have you ever paid for someone's meal just so you didn't have to eat alone? I know I have. Anyway, the beach is one of those places that people normally wouldn't want to go to alone and I didn't just want to go to the beach. 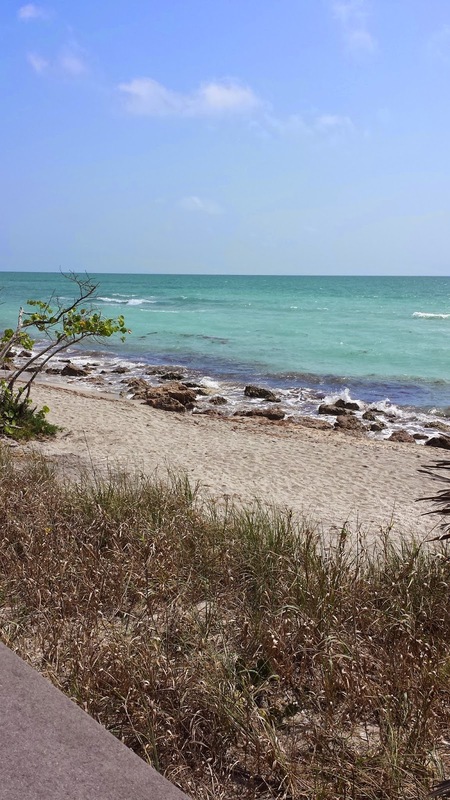 I wanted to go to a special beach an hour from my house. But I'm a tad stubborn and I wasn't going to let anything stand in the way of proving my self-sufficiency today. So I filled my tank, loaded my most recently purchased kpop songs, and hit the road. The drive was relaxing and jamming out to my iPod made it go by rather fast. I arrived at a relatively busy beach. It is a Saturday in April in Florida after all. It's to be expected. 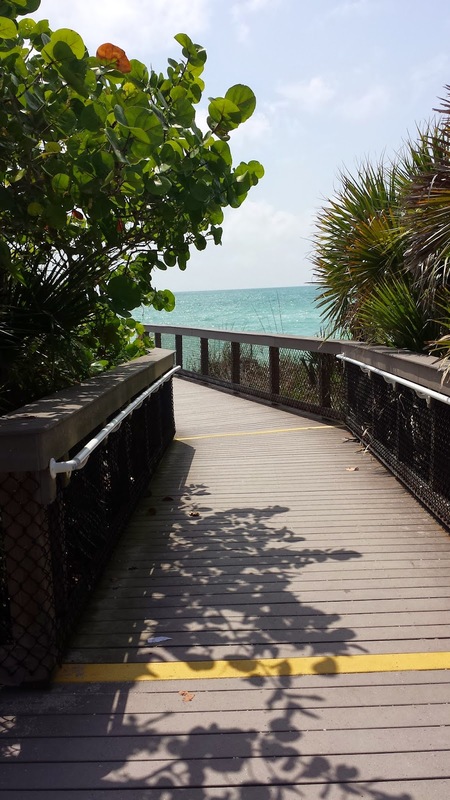 Undeterred, I changed into my beach clothes and headed for the boardwalk. So what did I find journeying to the beach alone? I found that I had a really good time. The ocean was just as beautiful looking at it by myself (more beautiful than I remembered to be honest). In fact, being by myself gave me time to enjoy my surroundings and just soak in everything I was seeing. I wasn't distracted with what anyone else was doing or saying. 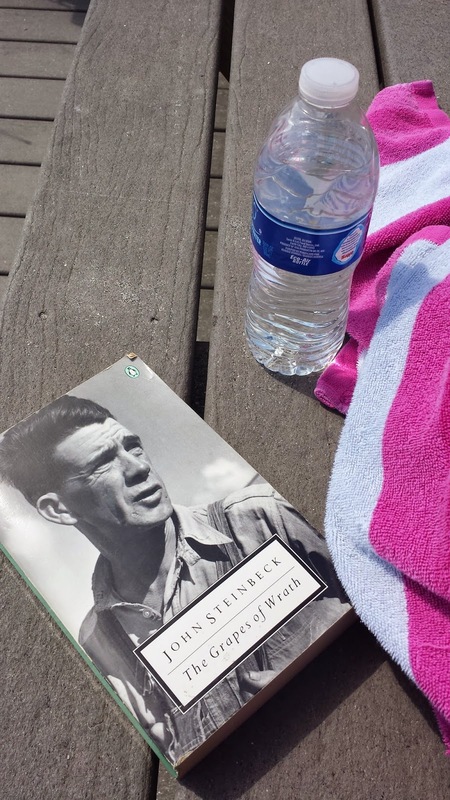 I found a bench facing the water and took an old-fashioned paper book copy of "Grapes of Wrath" and sat there reading for a good hour and a half. I couldn't have been more at peace even in my own home. Every few minutes I'd look up and just stare off into the distance and enjoy the view. I would have stayed a lot longer, but somehow I neglected to bring sunscreen and as a redhead with a notorious penchant for the sunburns, I didn't want to tempt fate. I left the beach feeling refreshed and at peace and it made me realize that I should do things like that more often. It's nice to rely on other people and to have them experience life with us when we can, but the reality is there aren't always people around to do the things that you want to do. It's not easy to do things alone, though. In the past I would steel up and go to the mall or go to the movies alone, but I'll admit there are still things I'm scared to do by myself. Because the truth is as humans, we're scared of other people noticing and what they'll think. But that's their problem. They're too short-sighted to think that a person could actually be choosing to be alone because they enjoy it. I could go on a rant about people minding their own business, but I won't. Instead, I'll end with this. Go places alone. It doesn't have to be all the time, but don't be afraid to do it. It's good for you. It slows things down and quiets your mind and it helps you to see things in a way you hadn't seen them before. Most importantly it teaches you to have faith in yourself. I swear it's such a simple little thing, but you will look at yourself in a whole different way once you've done it. Welcome back friends and future friends. It's time for the companion recap to the My Unfortunate Boyfriend Drama Club. This week we talk about blossoms of love, but there was more going on than just love. I can assure you. Let me give you a recap, or you can just skip to the bottom for some bonus thoughts. We start the episode with Ji Na punching Tae Woon in the face. She quickly realizes she misunderstood, but like I said, I'm proud of her for doing it. She didn't hesitate to take action when she thought she saw something unjust happening. The teenage friend of Tae Woon chastises Ji Na and in the process kind of reveals that she (teenage girl) is in love with him. Ji Ni leaves the flower shop in embarrassment over the misunderstanding she leaves without the flowers she went to pick up. Mr. Unfortunate chases her down with the flowers and after a series of misunderstandings a viral video goes around making it look like 1). Ji Na is pregnant and 2) Mr. Unfortunate has proposed. She insists to her co-workers that it's not true and they may or may not believe her. Meanwhile Ji Na's creepy friend takes her along to a wedding, where they are pretending to be enthusiastic friends of the bride for pay. And guess who shows up? Of course it's Tae Woon. Somehow he seems to end up everywhere Ji Na is. That's kind of the point, though, isn't it? You're supposed to be cursed after meeting him after all. Ji Na sees him and manages to hide herself from him until she accidentally catches the bouquet. He ends up almost revealing she doesn't know the bride so she takes him into the men's bathroom stall to tell him that she's a friend of a friend of a friend. Another innuendo scene ensues where all the on-listeners think they're getting busy up in the stall. Ji Na's weird friend and Mr. Unfortunate's weird friend meet and it's even more wonderful than I'd hoped. They have this creepy and disgusting food flirting scene that is perfectly their style. I can just tell that their relationship is going to be wonderful. Back at work Hye Mi and Ji Na are in fierce competition because only one of them gets to work on Hee Cheul's new project. Ji Na scores points for herself by stealing one of Mr. Unfortunate's lines when she can't think of any other ideas at the meeting. It's cheesy, but everyone likes it. 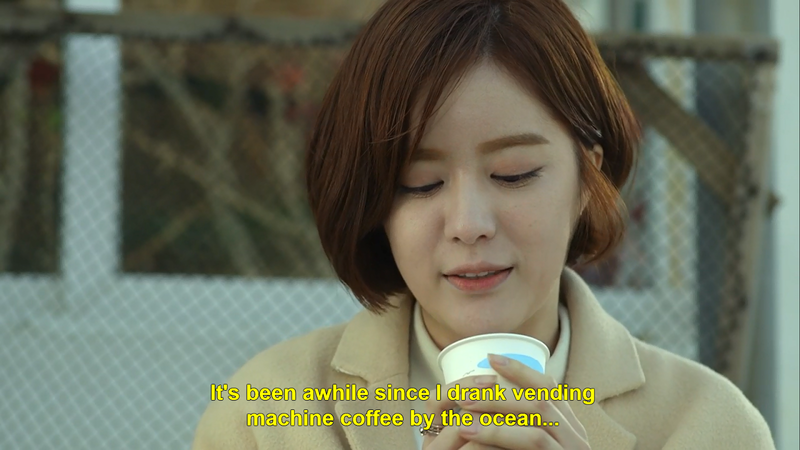 She takes an extra coffee to the garden in hopes of running into Hee Cheul, which of course she does. He asks her out to dinner again and says this time it will be just the two of them. What? Is he for real? Well, before Ji Na gets a chance to answer he gets a phone call from what sounds like a really important business guy who wants to meet for dinner. Hee Cheul says he doesn't have any plans. What the heck, Hee Cheul, have you no consideration for Ji Na. He apologizes and she turns another sour situation into a gem. She tells him it's okay because just having dinner together doesn't mean anything, not yet that is. Seriously, this girl is my hero. I'm just going to steal her lines. It turns out that Hee Cheul is meeting Hye Mi's father and guess who shows up? Hye Mi. That's the second time she's stolen time with Hee Cheul that was supposed to be Ji Na's. Anyway, when it comes down to the final presentation at work, Ji Na loses. Her idea is peaceful and simplistic, but Hye Mi copies an idea from someone else again and grabs everyone's attention. Seriously, Hye Mi, do you even have an original idea in that head of yours? Ji Na's understandably sad, I mean she is the better choice after all. And instead of comforting her the pregnant manager lady asks her to go find this seemingly eccentric plant specialist professor guy. Ji Na, being the eager to please employee she is agrees. So Ji Na goes to this orchard place to find this professor. 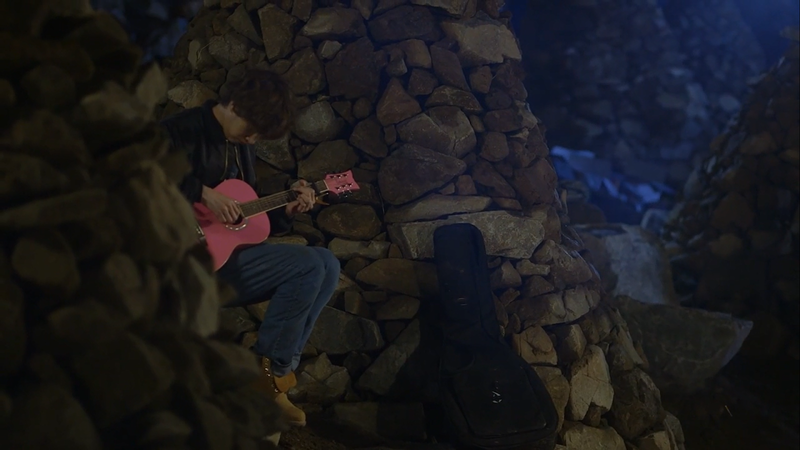 I already had a feeling that it was going to be Tae Woon because how could it not be really? After walking for a really long time she finally finds this professor and who does it turn out to be? Tae Woon. Well, at least we think it is because the episode ends on a cliffhanger. Guess we'll find out for sure next week. -That little girl is going to have her heart broken falling in love with Tae Woon. I hope they introduce a love interest for her too. -The scene where everyone thinks that Ji Na is pregnant and Tae Woon is proposing is comic gold. The writers on this drama are kind of geniuses. -I love that even Ji Na's mother saw the video of her and Tae Woon. -Tae Woon being moved to tears at the wedding was so cute. Every girl's dream is for a man who finds weddings beautiful. -Ji Na and Tae Woon's friends flirting scene was incredibly disgusting, but the fact that he snorted wine all over his face without cracking a smile was seriously the most amazing thing I've seen on this show so far. -There are soooo many innuendos on this show! -I love what Tae Woon says about Ji Na when he's describing to his diary why he likes her "A woman who does a sidekick when she sees injustice, a woman who runs like a marathonner in high heels, a woman who can speak up boldly wherever she may be..." He actually does see the real her, he doesn't just have these naive feeling with her and I may be getting a little sentimental, but that's quite beautiful. -Ji Na really needs a friend at the company, someone on her side. Hee Cheul is far too impartial. Seriously, writers please bring her a knight in shining armor because I'm going to be really distraught if she has no friends there. -Was anyone really surprised to see Tae Woon at the orchard? That's all for this week. Join me next week to take a look at episodes 5 and 6. As Buddy the Elf put it best, "I just like to smile, smiling's my favorite." I feel the same way, Buddy. I really do. We don't always feel like smiling. Sometimes it's hard and sometimes it's not even possible. But to me sometimes the simple act of smiling can turn my day around. I'm serious! Everyone has those days where you wake up and you just want to go back to sleep and do nothing else. So when I get to work and I'm feeling like crap, it takes every of self-control that I have to smile at that first person I see. But what happens when that person sees me smiling? 9 times out of 10, they smile back. And what happens when that person smiles at me? I now genuinely feel like smiling. I've just had a pleasant exchange with another human and I feel good about it. There's always going to be that person that doesn't smile back, but I say give them a break and smile at the next person anyway. We can't see through a person's face to know what's going on in their heart. You've probably heard that smiling boosts your mood, but did you know that your body literally releases endorphins from smiling even if you're only forcing it? Smiling is so natural to us. Even blind babies who have never seen or felt a smile will smile on their own. Isn't that just amazing? Anyway, I just wanted to share a big virtual smile with you all today. Hope everyone's day is the best day ever! though its ticking has been constant for years. I never stopped to listen for it. How have I been keeping time all this while? I have been relentlessly tardy. I strain to catch up, but my efforts are fruitless. I fall further and further behind. How many appointments have I missed completely? The world loves to laugh at my delinquency. I sit in the quiet pondering the cause of my perpetual tardiness. I hear the ticking that has always been there. And I realize that I have been keeping time by the wrong measure all this while. and I find that I have missed nothing. The clock's timing was perfect. The clock's timing is perfect. nor count praise any further. They are no way to measure time. was never meant for keeping time. The clock has always been and will always be the only way. All of us drama addicts have been there. You've just finished an amazing show. Over the last 16 or more episodes, you've grown with these characters and grown to love them and now their story is over. You will never hear from these people again and the thought it devastating. God forbid it was a tragic ending, that's even more damaging. There are ways to avoid the post K-drama slump and maybe we'll talk about those another day, but I'm talking about what to do when it's already happened to you. How do you cope? As I've shared, my first Korean drama experience was with Boys over Flowers and I was so devastated afterward that I moped around the house for two days and wouldn't watch any Korean dramas after that for four months. Can you imagine? 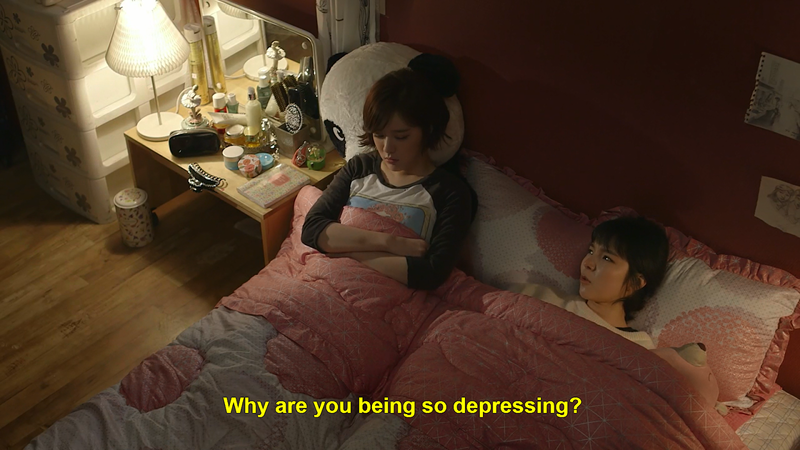 Me abstaining from Korean dramas for four months? I know, it was crazy. 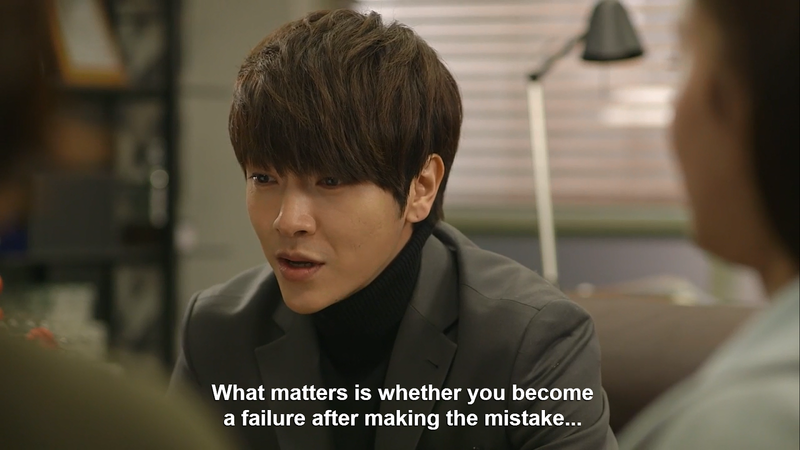 Since then, in order to maintain emotionally healthy Korean drama watching habits, I have mastered different techniques to make sure that I don't fall into that post-drama slump and ones so that if I do, I can get right out. So, I've compiled a list of tips for all my friends who might be struggling with a K-Drama slump right now. 1) Start another drama right away- Seems counterintuitive, I know, but it works. A lot of times after a really strong drama you're not going to feel like watching anything else, but make yourself. Just one and half episodes. At that point you're invested enough in the new drama that you don't feel the loss of the last, but not so invested that you have to dedicate your life to it yet. Make sure to stop in the middle of the second episode unless you want to roll head-on into another drama binge. Stopping in the middle of an episode is the best place to stop, because as any addict knows, all episodes end on horrible cliffhangers. 2) Talk about the drama- Get it out of your system! Find someone else who has seen it and share the emotions. If you don't have any K-drama watching friends check my list and if I've seen it we can have a heart-to-heart. Lol. But seriously, find blogs or videos about the drama. Hearing other people share the same feelings as you will make getting over it easier, because you know the characters will never truly be lost as long as you keep them alive in your heart. 3) Re-watch the first episode- When you realize that the story is pretty much always going to be there and you can go back and rewatch at any time, it'll make you feel better. I've re-watched many of my favorite dramas- sometimes more than once. Seeing the beginning of the story again helps to reset your frame of mind. 4) Start an American (or British) show- Gasp! I know, I know, but there is still some good American television out there, people. Sometimes if I hit the K-drama slump I just need to change it up a bit and watching a show in English helps me to do that. They're working from a different set of plots so you're getting a whole different kind of storyline. Of course, but unfortunately, these tips are not going to work for everybody all the time. But it's definitely worth a go. I've helped a few others through their slumps and I know I've helped myself through a few (49 days, anyone?). Anyone have any tricks they use that I didn't mention?